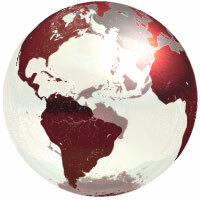 Sustained economic development is impossible within an effectively closed system like Planet Earth. It is therefore more than a little surprising how much attention today is being focused on climate change and yet how little is being directed toward the potentially far more pressing issue of resource depletion. Fortunately these two challenges are inter-linked to the extent that most measures intended to combat climate change do involve using less resources and/or recycling precious materials. However, the fact that nobody has won mass public or political attention to the cause of using less resources because they will run out -- as opposed to using less resources because doing so may help us to combat climate change -- remains more than a little bizarre. It cannot now reasonably be denied that the Earth's natural resources are currently being consumed at an increasing and totally unsustainable level. As a result, within a generation oil and many precious metals are likely to be scare and far more expensive. 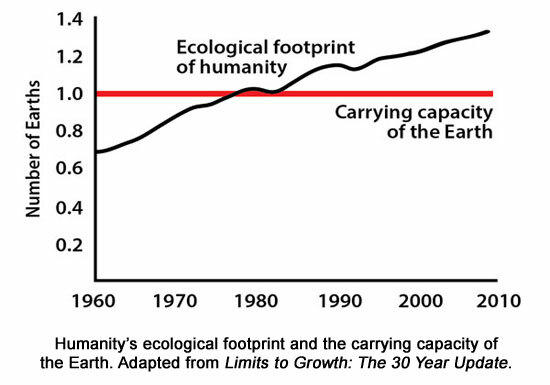 In 1972, an influential study called The Limits to Growth warned that humanity would start to exceed the carrying capacity of the Earth if we did not change our ways. Unfortunately, capitalism continued unabated, and 40 years later humanity's ecological footprint is at least 20 per cent beyond what the Earth can sustain. The figure below indicates this alarming the situation diagramatically. And if you look at this figure and think "well, we are still here -- so this must be wrong", just remember that any living system can exceed its limits for short period, but not indefinately. In 2011 the United Nations Environment Programme reported that, if nothing changes, humanity will demand 140 billion tons of minerals, ores, fossil fuels and biomass every year by 2050. This is three times our current rate of resource consumption, and far beyond what the Earth can supply. We therefore need to fairly rapidly learn to decouple natural resource use and environmental impacts from economic growth. Coping most successfully with resource depletion will requires a broad range of strategies. These are likely to include more local living, low energy lifestyles, dematerialization, design for repair and the death of economics as our primary resource allocation mechanism. All of these things (and more) also happen to be the subject of my book Seven Ways to Fix the World, and are likely to include the development and application of new technologies including 3D printing and synthetic biology, as well as the propogation of new, more sustainable narrative. In the longer term, in addition to learning how to consume less, we are also likely to have to deal with resource depletion by venturing beyond our first planet to find more resources. The cupboard of our first planet will at some point inevitably start to run bare.